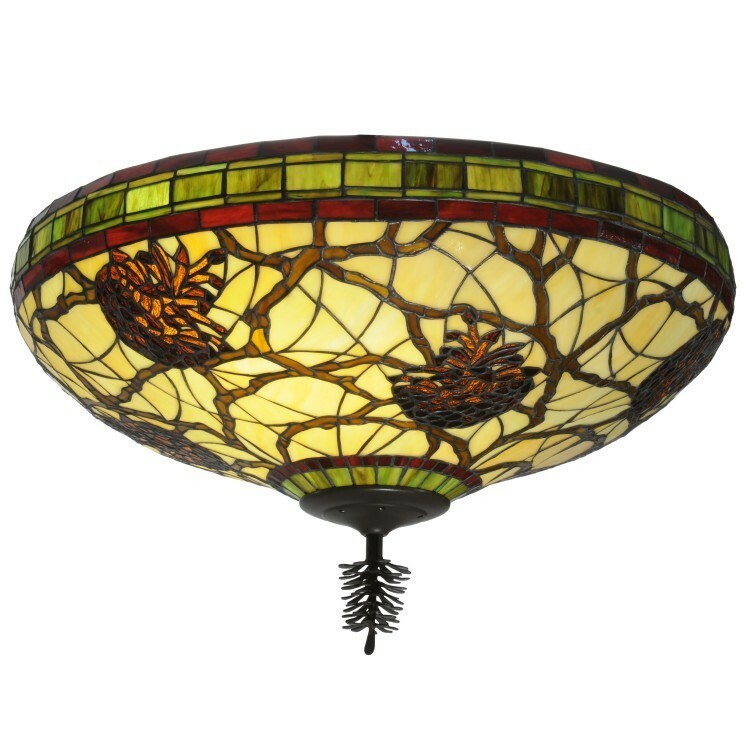 Bring the great outdoors into your home with this stunning pine cone ceiling light featuring a pine cone and branches motif. This fixture utilizes energy efficient compact fluorescent lamps to save energy costs and minimize re-lamping time and efforts. Beautiful natural stained glass colors come alive in Sunrise Beige, Moss Green, Autumn Leaf Burgundy and Woodland Brown. Bring the great outdoors into your home with this stunning pine cone ceiling light featuring a pine cone and branches motif. This fixture utilizes energy efficient compact fluorescent lamps to save energy costs and minimize re-lamping time and efforts. Beautiful natural stained glass colors come alive in Sunrise Beige, Moss Green, Autumn Leaf Burgundy and Woodland Brown. Its skirt features a Moss Green tile accent design. The fixture is handcrafted, using the world-famous copperfoil constructed process created by Louis Comfort Tiffany. Elegant Mahogany Bronze hardware makes it suitable for any space, and includes a pine cone finial accent.